Sometimes I think we are too quick to be comforted by the Scriptures we hear in church and consider in Bible Study, like the parable above. Maybe it is about the wonder of faith or the need to be ready to bring in the harvest. Or it might be about our complete inability to control the coming kingdom as though our believing (or not) affects its coming. This second possibility is uncomfortable because it leaves us vulnerable. God’s kingdom comes apart from our efforts, cannot be controlled or influenced, and can only be received as a gift. In this sense, faith is apparently a lot more like falling in love than making a decision. Because faith, like love, is something that comes from the outside and grabs hold of you, whether you want it to or not. If this is true, then how are we to regard those who do not seem interested in our homilies, parish, or the Kingdom of God? The members who have “fallen away,” the family members who opt to golf on Sundays, the friends or co-workers who think our attendance on Sunday is nice but seem to have no interest in why we go? Are these folks objects to be targeted, persuaded, and cajoled into faith? Or are they mysteries to be understood and loved, part of the fertile soil that God may be working apart from our efforts. And perhaps the faith we hold, the bits of the kingdom we have perceived, can only be offered with no strings attached, with the same enthusiasm and generosity of a child. 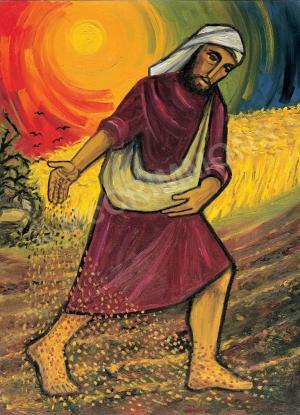 What about the parable of the mustard seed? “To what shall we compare the kingdom of God, or what parable can we use for it? It is like a mustard seed that, when it is sown in the ground, is the smallest of all the seeds on the earth. But once it is sown, it springs up and becomes the largest of plants and puts forth large branches, so that the birds of the sky can dwell in its shade.” (Mark 4:30-32) Perhaps it is about how God can grow small things into grand ones. Or maybe, just maybe, it’s really about the kingdom’s desire for penetrating and taking over our lives. The mustard bush/tree had the ability to be like an invasive weed, something you want to keep off your property at all costs because it runs amok easily, gets out of hand, and takes over whatever ground it infests. So also with God’s kingdom. If it were packaged maybe there would be a warning label – “use only in moderation” or “may be hazardous to your health.” But that’s just it, the kingdom isn’t a commodity to be bought and sold or used diligently but carefully. It’s a reality that invades, overturns, and eventually overcomes the world you thought you knew. It’s a word of promise that creates hope and expectation to leave behind your old ways to live into it. The kingdom is dangerous because you just don’t know where it will take you or what you will do when it seizes hold of you. This entry was posted in Musings and tagged The Kingdom of God by Friar Musings. Bookmark the permalink.